The Rio Olympics are underway, and after a build-up that’s already been marred by the Russian doping scandal, officials will be on the look-out for athletes trying to gain an edge by using performance-enhancing drugs. 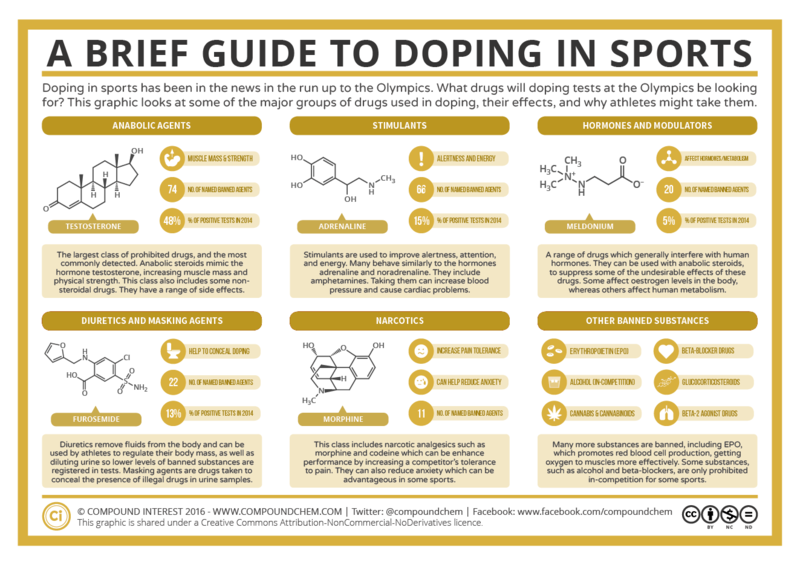 What types of drugs will they be looking for, and why might athletes be tempted to use them in the first place? This graphic takes a look at some of the major classes of banned substances and the reasons that they are banned. Anabolic agents are the biggest class of prohibited drugs at the Olympics, and they’re also the most frequently detected. In 2014, the World Anti-Doping Agency found that 48% of positive tests were due to the use of anabolic agents. Their list of prohibited substances names around 74 different agents, but also includes any substances with similar chemical structures. Anabolic steroids are the major group of drugs included in this class. They are structurally similar to the natural human hormone, testosterone, and when taken mimic its effects. As such, they are used by athletes to help them increase their muscle mass and physical strength. Commonly, they’re taken in the run-up to competitions, rather than during the competition itself. This would make them harder to detect with testing at the Olympics alone, which is why out-of-competition testing also takes place. With that said, recent research has found that steroid metabolites persist in the bodies of those using them for several months, making them easier to detect. Anabolic steroids were at the centre of the recent Russian doping scandal, detailed in a previous post with C&EN magazine. Their cocktail used a combination of three different steroids; one of these was changed as detection methods for it improved. Metanedienone, developed in the 1960s, was regularly used by body-builders, weight-lifters, and shot-putters before anabolic steroids were banned from Olympic competitions in 1975. Steroid use doesn’t come without risks. Their side effects include high blood pressure, which can lead to heart disease, and also kidney damage. In both men and women, they can also have aesthetic effects. For men, they can shrink the testicles and enlarge breasts, as well as reducing sperm count. In women, they increase body hair, decrease breast size, and deepen the voice. This category of drugs also includes some non-steroidal agents, and notably clenbuterol. Clenbuterol is used to treat breathing disorders, as it widens the airways and also acts as a decongestant. For athletes, it has modest muscle-building effects, but can also be taken to help increase the metabolism and help burn fat. A number of athletes in a variety of sports have been banned for using this drug. The second most frequently detected class of doping drugs are stimulants. In 2014, they accounted for 15% of the positive tests recorded by the World Anti-Doping Association, and the stimulant methylhexanamine was reportedly found in 45.9% of positive athletics urine samples worldwide in 2012. Stimulants are substances that help increase alertness, energy, and attention. A number of them behave similarly to the human hormones adrenaline and noradrenaline, commonly referred to as being involved in the body’s ‘fight or flight’ response. A very well-known example of a stimulant is caffeine, which isn’t banned in Olympic competition. Banned stimulants include amphetamines and cocaine. As with anabolic agents, there are health issues associated with stimulant use. Many of them are addictive, and their use can also increase the risk of heart failure. They can also lead to exhaustion. Modafinil, a stimulant that was added to the list of prohibited substances for Olympic athletes in 2004, reportedly prolongs exercise time for athletes, and several athletes have been banned for its use. This class of prohibited substances is large and varied. Generally, they tend to be substances that interfere either with human hormones or metabolism to give athletes an edge. They can also be used in conjunction with anabolic steroids, as they can act to reduce some of the undesirable physical effects of these drugs. Some of the drugs in this class are those that effect the hormone oestrogen. This can be beneficial for men using anabolic steroids, as steroid use leads to gynecomastia, or enlarged breasts. Oestrogen-inhibiting drugs can help minimise these effects. They are usually taken for this purpose, rather than having any effect on athlete performance. This class of drugs also include meldonium, which shot to prominence recently when tennis player Maria Sharapova was banned for using it. Meldonium is a drug that can be used to treat some heart problems, particularly coronary artery disease. It helps widen the arteries, which can be useful for athletes as it helps increase the flow of oxygen to the muscles in the body. Meldonium was banned at the start of 2016 after evidence showed that athletes in 15 out of 21 sports at the Baku 2015 European Games were using it to help enhance their performance. Since being banned, 124 positive samples have been taken from athletes in various sports, a large number of them Russian. Meldonium’s ability to enhance performance has, however, been debated, particularly by the Latvian manufacturer of the drug. The drugs in this class are used for two purposes. Diuretics are substances that promote the excretion of water in urine, and can be used by athletes to regulate their body mass, particularly in events where competitors must be at or near a certain weight such as boxing. They can also be used to mask the use of other banned substances, as by diluting the urine they can help reduce the concentration of banned agents and their metabolites. Masking agents are substances that impair the detection of substances in the urine, either by concealing or interfering with detection of metabolites of banned substances. Diuretics and masking agents can lead to a range of side effects, including dehydration and affecting salt balance. One of the most commonly used diuretics is furosemide, which can increase urinary excretion by a factor of 30. Their continued use can lead to gastrointestinal problems and kidney damage. Narcotics are used primarily to manage pain. This can be to help athletes overcoming minor injuries, or to simply increase their pain tolerance during events. They also help reduce anxiety, which can be a benefit in the high pressure environment of the Olympics. This class of drugs includes well-known substances such as morphine and codeine, collectively known as opioids. While these drugs were commonly used in the first half of the 20th century in combination with anabolic steroids, their use has drastically decreased due to the ease with which they can be identified in urine. The use of painkillers which are not on the prohibited list of substances, such as aspirin, has also reduced their use. The side effects of narcotic use can also be severe. They are particularly addictive, and the body can also build up tolerance to them, meaning that the dose has to be routinely increased to see the same effects. Over-use can also lead to adverse psychological effects. Though the main groups of abused substances have been discussed so far, there are a number of other substances whose use is prohibited. Some are banned outright; these include cannabis, cannabinoids, and glucocorticosteroids. Others, such as alcohol, are only banned in-competition in particular sports such as archery. Further substances are banned only above certain thresholds; for example, beta-2 agonists, primarily used in the treatment of asthma in inhalers, are largely banned, but the used by asthma sufferers are permitted to certain levels. Another banned agent worth a more extended mention is erythropoietin (EPO). This is an agent used in what is sometimes termed as ‘blood doping’, the practice of taking substances to increase the number of red blood cells in the blood. EPO is a hormone that stimulates red blood cell production. Red blood cells help carry oxygen to the body’s muscles, so increasing their number should help increase athlete performance. Gene doping can also be used to achieve similar effects, as C&EN detailed recently. It’s clear that doping in athletics is a constant game of cat and mouse, as the recent issues with meldonium illustrate. Though some athletes risk the use of banned substances to gain an edge, it’s clear that a number of others attempt to do so using substances that the World Anti-Doping Agency has yet to explicitly ban. Retroactive testing on samples taken at previous Olympics make it much more likely that those using doping to get ahead will be caught out, if not immediately, then eventually.